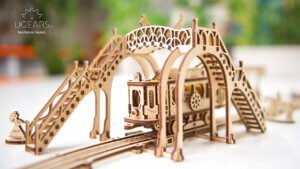 UGEARS is glad to inform you that on May, 15, 2017 we are launching Tram Line, the first mechanical model from the new Mechanical Town Series. 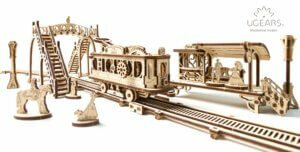 Tram Line model consists of 14 parts and come in a convenient scale for building and playing with. First of all, the new model has gaming component and we think it’s great for hobby & collection. 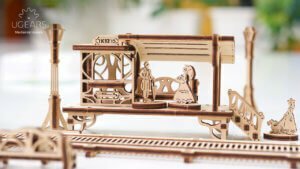 Each part has a unique design and interesting engineering. 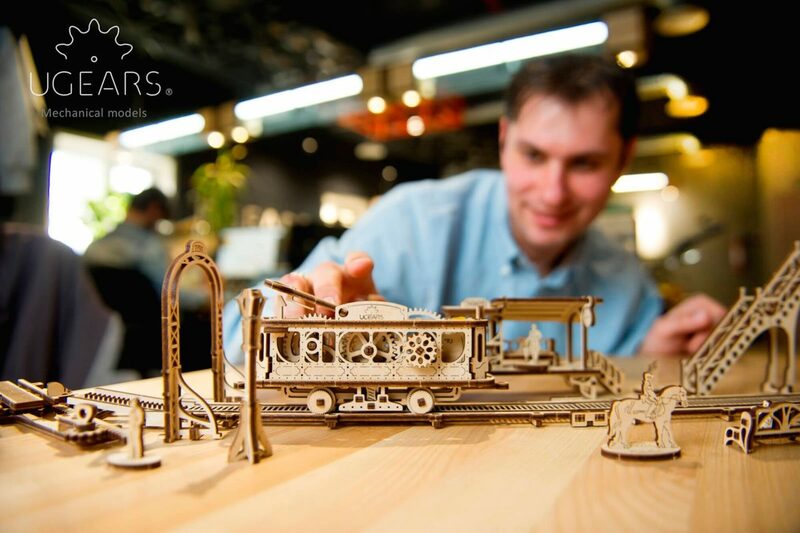 Another innovation – UGEARS’ Tram Line model doesn’t need glue or special tools or even toothpicks to connect parts, as a result -you can put all together easier then before. Tram Car has an overhead pantograph for stepping it up to “drive” mode and a knob for opening and closing doors. Wind-up of the tram car and watch it move on the rails, entering into the Depot. After turning on 180 degree on the turntable, it moves on its own to the end of the line. There is no electricity inside: just gears, wheels, cranks, rubber band engine and tons of fun! Tram Stop complete with a clock, a bench, a little stairs and also a Ticket Kiosk. The stairs are removable, so you can place them in any part of platform. A Tram Depot with a gate where the tram drives in and where it prepares for the next trip according to the route timetable. The depot has also a turntable for turning the tram on 180 degree for the next trip. In addition we created a special “tongue” on the rails of the turntable. Therefore the “tongue’ stops the tram in the closed position, and reclines after the turn of the turntable allowing the tram move on the return route. Footbridge – the pedestrian crossing – is made in the form of arches and set across the tracks. It can also be located at a crossroads, and cars can pass through arches.